Despite the popularity of the sport, there are very few shore excursions that involve professional baseball. However, Boston is a baseball town and so it was not a complete surprise to find a baseball-oriented tour during a port call in Boston. 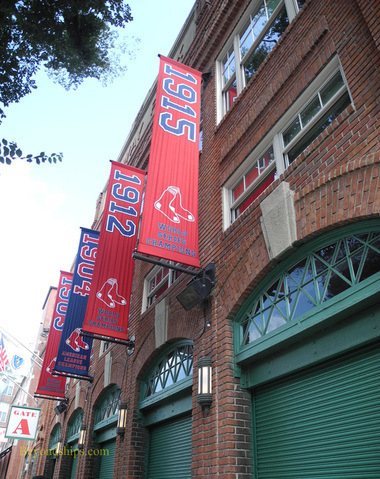 Professional baseball in Boston means the Red Sox and their long-time home is Fenway Park. 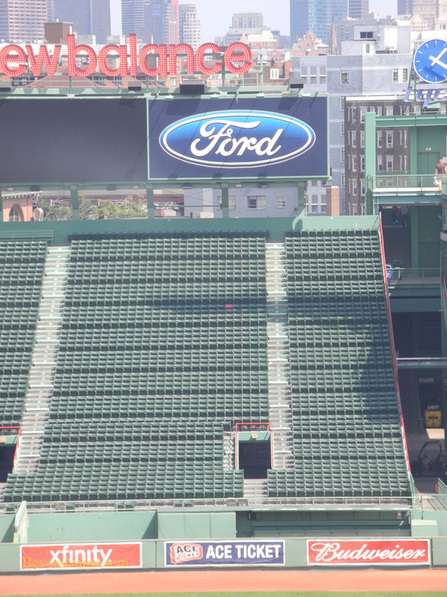 Because of its intimate size, Fenway is a great place to see a game. 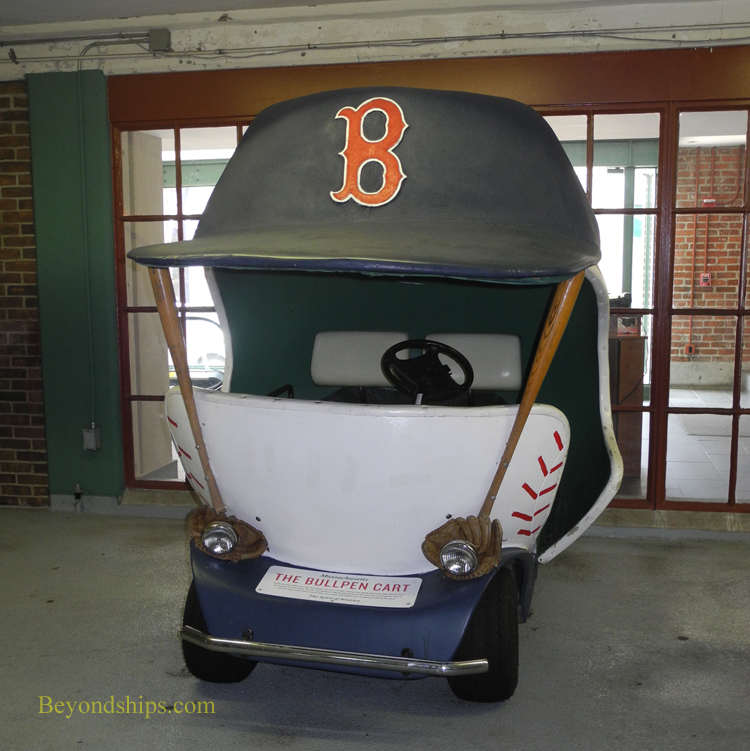 However, this shore excursion was going to Fenway on a day when the Red Sox were playing in California. Why go to a baseball stadium when there is no game? First, there is the lure of getting a behind-the scenes look. And, in the case of Fenway, it is the site of so much baseball history. 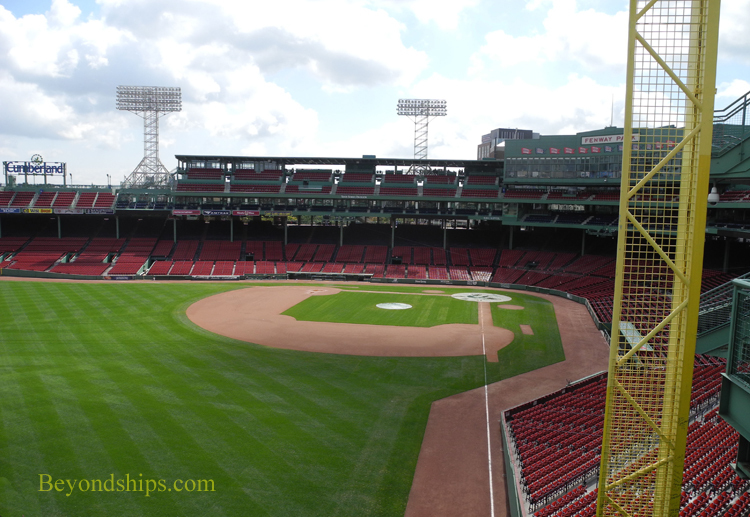 Construction of Fenway Park began in 1911. It was built on an asymmetrical block with established streets forming its boundaries. 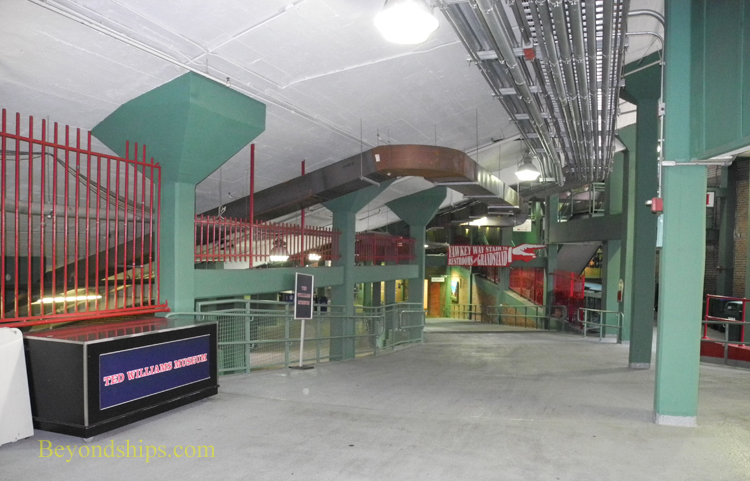 As a result, because the stadium was built to fit this irregular space, Fenway is not symmetrical and is full of interesting quirks. 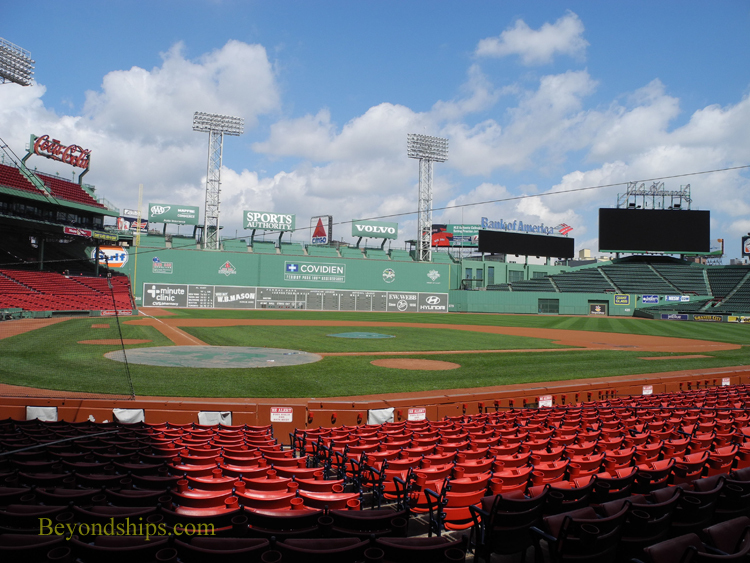 Fenway opened in April 1912, a few days after the sinking of the Titanic, in a game in which the Red Sox defeated the New York Highlanders (later re-named the Yankees) - - the start of an enduring rivalry. 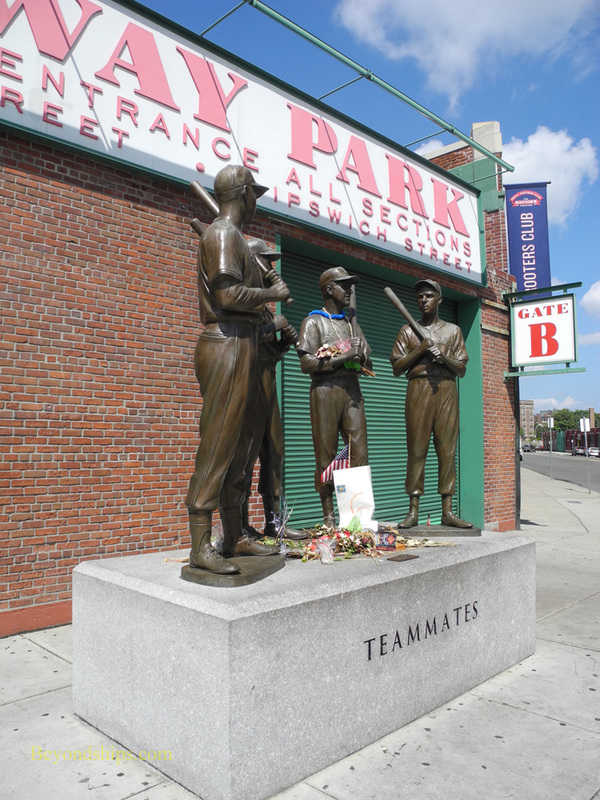 In the years, which followed Babe Ruth first achieved fame here, Ted Williams displayed an unrivaled hitting ability and numerous other baseball legends appeared. Furthermore, because the Red Sox were often in contention for the American league championship (and several times the World Series championship), many important games were played here. Perhaps because of the intimate size of the park, Red Sox fans have been described as participants rather than spectators at a game. 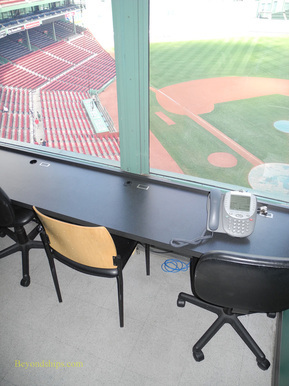 While other more modern baseball stadiums may have better features, none are more beloved by fans than Fenway. I had assumed when I signed up for this excursion that most of the people going on this tour would be Red Sox fans. Apparently, everyone else on the tour had made this same assumption for when our guide asked the 30 or so people on the tour whether the Red Sox were their favorite team, there was much shuffling about and looking around uncomfortably. This dissipated when only one of the participants raised her hand. The people were taking the tour because they were interested in baseball in general, not because they were fans of the team that played here. When you think about it, this is not really surprising. Boston was not the embarkation port for this cruise but rather a port of call and so most of the people on the cruise came from cities other than Boston. Since a fan's baseball allegiance is usually to one of the hometown teams, it followed that most of the people on the cruise would not be Red Sox fans. However, true baseball fans have an interest in the game that transcends which team they root for during competition. The tour took us all over the park's grandstands. The guide pointed out which sections were part of the original structure and which had been added on over the years. We sat in seats that had changed little in almost a century and we climbed to a relatively new cafe section where you could purchase pizza or one of the park's renowned frankfurters. Of course, we went atop the legendary Green Monster. 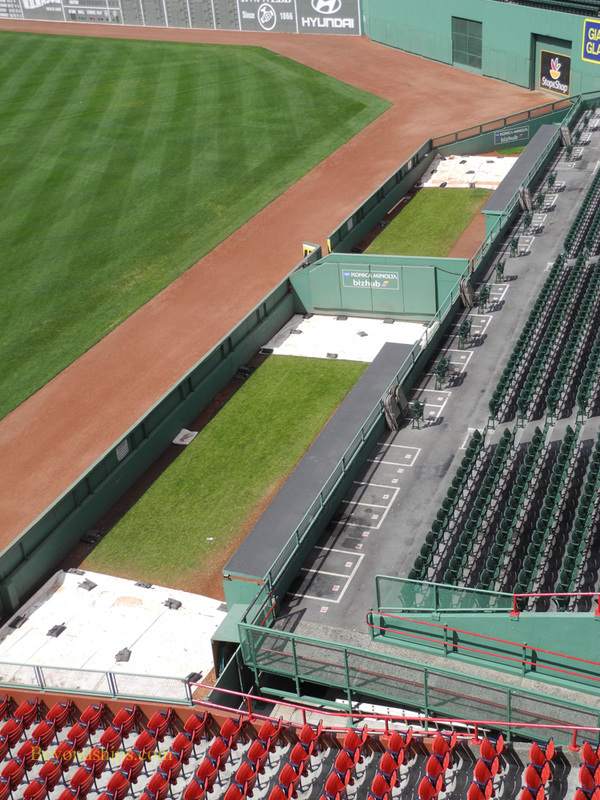 The Monster is a tall (37 feet), green-painted fence that marks the outer boundary of left field. Since it is a relatively short distance from home plate (315 feet), it is susceptible to home runs, particularly from right-handed hitters - - a nightmare for pitchers. Our guide, recounted the story of how with the score tied in the 12th inning of Game Six of the 1975 World Series, Red Sox catcher Carlton Fisk hit a long fly ball to left field. It appeared to be drifting foul. However, Fisk jumped around and used body language to keep the ball in fair territory. The ball hit the foul ball and was thus a home run. It won the game. It was a great moment in Red Sox history and there is a bronze plaque by the foul pole in tribute to Mr. Fisk. One of the tour participants remarked that we were standing where another famous home run had landed. In 1978, the Red Sox had led the New York Yankees in the standings by some 14 games at one point in the season but the Yankees had erased the deficit, forcing a special one game playoff. The Red Sox were leading in that special game when Yankees shortstop Bucky Dent came up in the 7th inning with two men on base. Mr. Dent was not known as a power hitter but he hit a pitch over the Green Monster thereby ending the Red Sox's bid to play in that year's World Series. Perhaps not surprisingly, there is no plaque at Fenway mentioning Mr. Dent's achievement. Over in the right field stands, our guide pointed out that one of the seats is painted red while all the others are green. 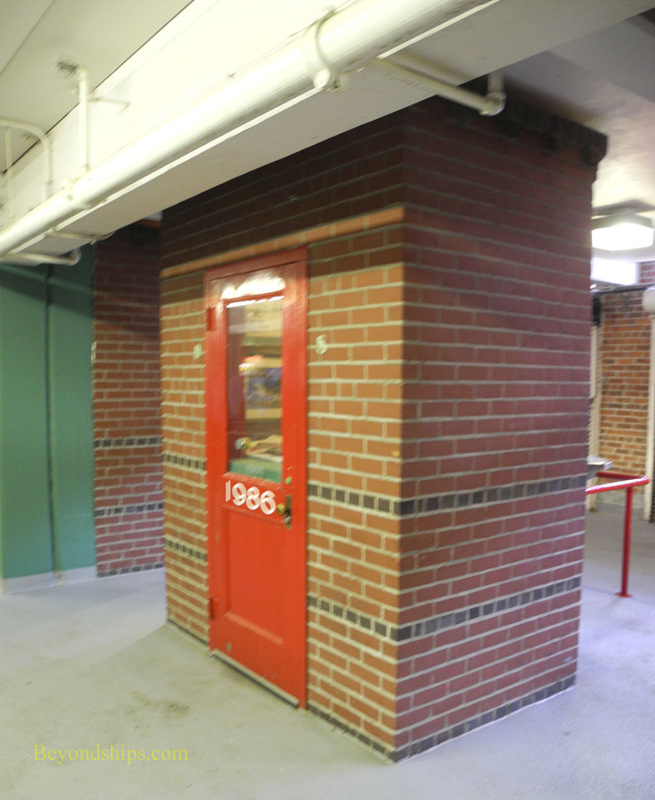 It signifies the spot where the longest home run ever hit at Fenway landed. The ball hit by Ted Williams had traveled 502 feet. It would have gone further but the story goes that it hit a fan who had dozed off in that seat. Even though the fan was hit in the head, he was not seriously hurt because he was wearing a straw hat. The incident brought him instant fame in Boston. The only problem was that he had excused himself from work that day claiming that he was sick. We heard many similar anecdotes about incidents that had occurred at Fenway. Our guide also told us about how football was once played there and of the many famous rock stars who have given concerts at Fenway. Somewhat disappointingly, the tour did not involve much of a behind-the-scenes look. We did visit the press booth and were able to sit where the television and other media journalists do when they are covering the game. We also saw some of the areas that are restricted to holders of upper echelon tickets. However, we did not get to go in the dugouts or into the clubhouse. Our guide did indicate that if he could find the head groundskeeper, he might be able to persuade him to let us go onto the field. The thought of actually being on the field where Babe Ruth, Ted Williams, Carl Yastrzemski and so many other legends have played sent a wave of excitement through the group. But the groundskeeper proved elusive and so we were only able to look at the field from afar. Both before and after going to Fenway, our guide took us on a tour of downtown Boston. We went past the Chinatown Gate, though Copley Square, past some of the universities and museums such as the Boston Museum of Fine Arts and along much of the Freedom Trail. Inasmuch as our guide was a native Bostonian, we were able to get an interesting local perspective on living in this historic community. 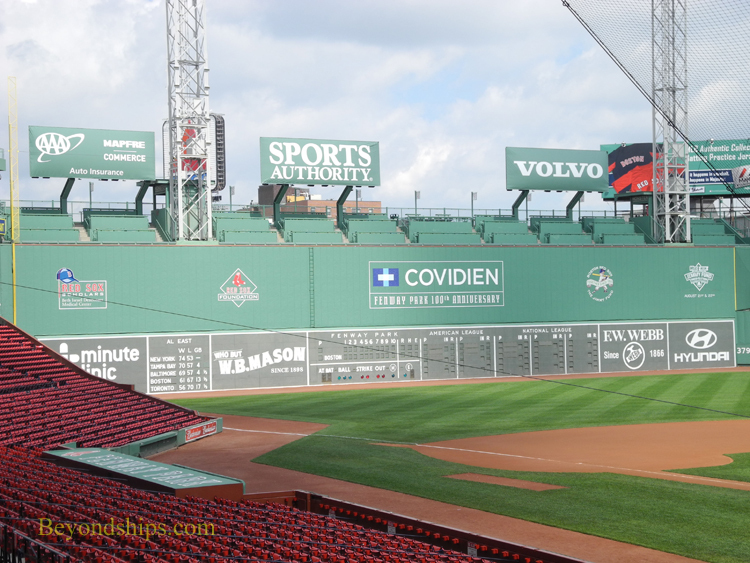 While I still must wait for some major league scout to recognize my natural baseball abilities before I am allowed to go on the field at Fenway, I found this to be a memorable shore excursion. It is particularly good for people who have been to Boston before and seen its historic sights as this is something out of the ordinary. Above: Fenway was not Boston's first professional baseball park. Both the Red Sox and the Boston (later Milwaukee, still later Atlanta Braves) played on fields where Northeastern University now stands. 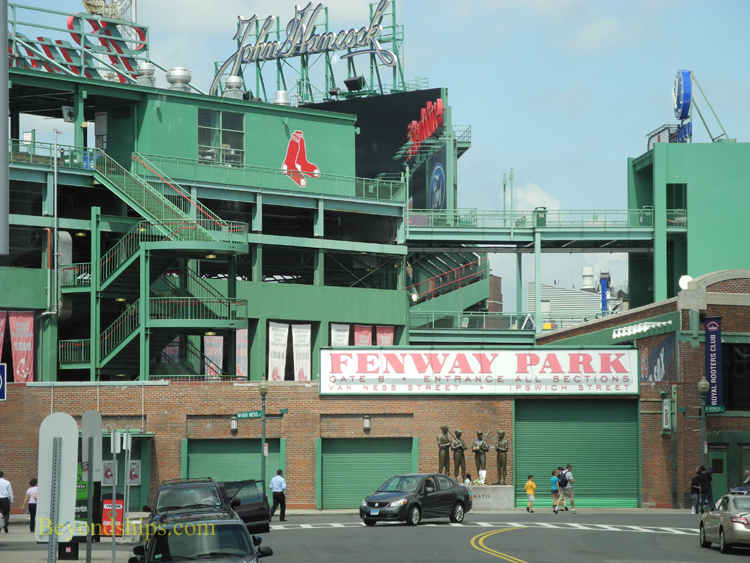 Below: Unlike more recent stadiums, Fenway is not surrounded by parking lots but rather is in the midst of the city. 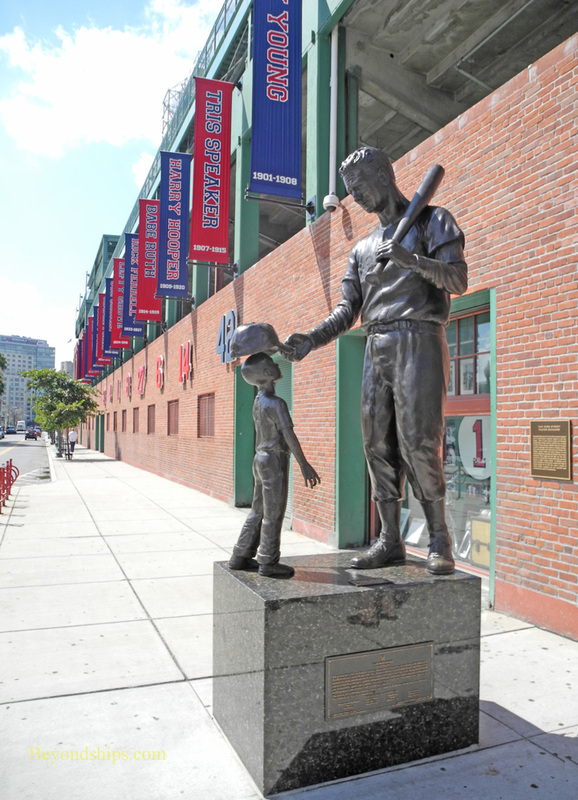 Outside the stadium is a statue in tribute to baseball legend Ted Williams, recalling his work for cancer-stricken children. Inside the usually bustling area beneath the stands was deserted. 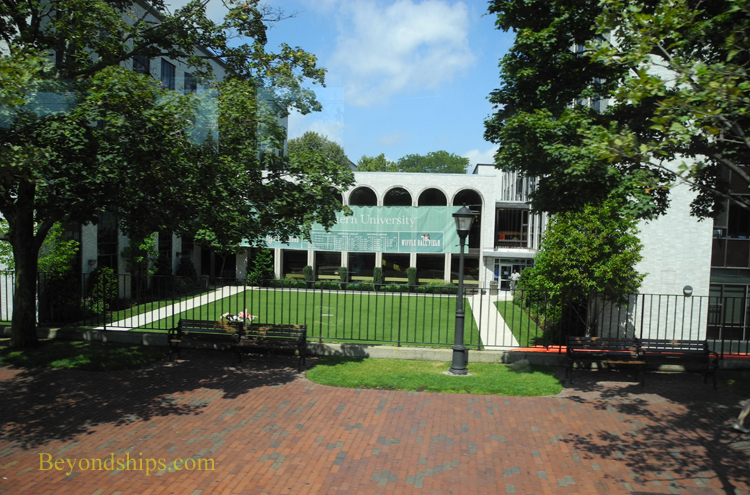 Exhibits from the past in this area include ticket booths and a golf cart once used to bring relief pitchers to the mound from the bull pen. The view from the Fisk Foul Pole atop the Green Monster. Above: One red seat (in shadow) in a sea of green. Below left: The bull pens are sometimes referred to as "Williamsburg." Below right: The view from the press booth.